AAE’s foaling program was designed to help support the rescue of pregnant mares and mare/foal pairs destined for slaughter. The Foaling Project allows families to experience the magic of the mare pregnancy and foaling process. This is an eight week project intended as an educational experience: an introduction into the basics of mare pregnancy, foaling, and foal handling/development, as well as discussion of common pregnancy and foaling complications. The class also will provide insight into the state of the horse industry, the unwanted horse, responsible breeding and care practices, the needs of pregnant mares and developing foals, and other related topics. Attend one or all of the classes - whatever fits your schedule! Classes are held during the summer - check the Events/Calendar page for dates and times. Cost: $40/person ($5 per class), all fees go directly to the support and maintenance of the participating mares (and foals). 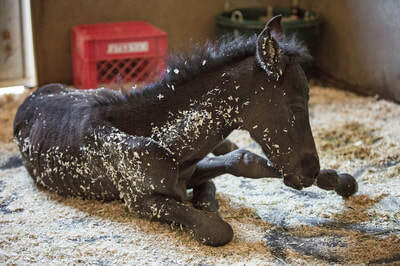 The Foaling Project will be held at Cedar Springs Arena & Livery at 4420 El Dorado Road in Placerville, CA, and is a collaborative effort between AAE and CSAL.